I am often asked about products and services I recommend, whether it be my favourite brand of honey or the type of spiralizer I use. Since I get a number of messages on this topic, I thought I would start to compile a list of my favourite things here for you! Be sure to check back often, because I will continue to add to this list as I discover new goodies to share! I get SO many questions about where I went to school and why I loved it so much (So much in fact, that I wrote a blog post about it). I became a Registered Holistic Nutritionist (RHNP) through Nutraphoria School of Holistic Nutrition. I did the entire program virtually from home with a brand new baby (the only way it would have been possible for me). They offer a Tier 1 program (Certified Health Coach) and a Tier 2 (Registered Holistic Nutritionist). Not only did the information I came out of the program with change my OWN life and my health forever, but it gave me a platform to begin my own Holistic Nutrition Practice. Plus, I did it all from the comfort of my own home, at my own pace (I completed the entire 2-year program in 14 months). Whether you want to learn more in the world of Nutrition for your own health OR for a future career, I would highly recommend Nutraphoria! When I first heard about NaturaMarket, I was BEYOND thrilled, because many of my favourite natural products are harder to source in Canada, This is my go-to online store for things like Vital Proteins Collagen Peptides, Beef Gelatin or bone broth collagen, Primal Palate's organic, non-irradiated spices, Primal Kitchen's avocado oil mayo or dressings (hold the gross additives! ), and even some Siete Grain-free tortilla chips now and again! But they have more than just snacks - They also care lots of bath & body products (natural sunscreens, deodorants, toothpaste, facial care products, etc.) and even natural home & cleaning products! If you live in Canada (ESPECIALLY if you live in the boonies like me), it's totally worth checking out NaturaMarket as an online one-stop-shop! Save 10% off all Raw Elements products plus get FREE shipping on orders over $100 by using code "UNITE" at checkout! If you follow me on Instagram, you likely already know that I'd much prefer a warm elixir over a coffee most days! While I do enjoy the taste of coffee, it impacts my adrenals significantly and I know it just doesn't work for my body! Ever since I discovered elixirs, they've replaced coffee and have become a fairly common part of my regular routine. I love to add whatever herbs, superfoods or adaptogens I think my body needs that day, and I find myself reaching for FourSigmatic's organic mushrooms elixirs nearly daily! Whether I'm using Chaga for it's immune or antioxidant properties, Cordyceps for energy, Lion's Mane for the brain, digestive system or nervous system (my personal favourite! ), or Reishi for sleep or stress support, mushrooms can offer some pretty beneficial properties to the body! I get a TON of questions about what kind of mushrooms I add to my elixirs, and Four Sigmatic is most definitely my brand of choice. In my humble opinion, not all 'shrooms are created equal. I use Four Sigmatic's mushrooms because they're certified organic, and either wildcrafted or log grown. They also test for heavy metals, pesticides, irradiation, mycotoxins, and other factors, so I never have to question whether I'm getting something that is legit. I really enjoy adding packets of lion's mane or cordyceps to my morning elixirs, or having a reishi hot chocolate before bed as a little night cap! I even travel with their individual packets so I can add them to my tea on the road! Here's a crazy fact for you: Did you know that most of the honey you'll find on the market isn't actually honey? It's true! Much of the honey available has been adultered with antibiotics, or has been cut with cheaper sweet alternatives such as high fructose corn syrup or rice syrup. Crazy, right? I actually wrote a blog post about this topic which you can check out by clicking here. Their propolis spray, AKA "Nature's antibiotic. I keep some in my holistic medicine cabinet ALWAYS and I use it when I travel. I even sent a bottle overseas with Ryan to keep his immune system in tip top shape while he worked away from home for the last 6 months! Their sweet clover honey, which is often the safest type of sweetener for those struggling with digestive issues such as SIBO. Their "bee powered" superfood complex which I add to elixirs for a little extra superfood boost. And lastly, for those times when I'm making a little decadent treat, I love using a bit of their superfood cacao honey. It's DIVINE! Check these guys out and let me know what brands you've been loving in the comments! Living Libations - "The purest of the pure botanical health and beauty products on the planet." I was introduced to Living Libations at my local health food store recently, and I completely fell in love with their natural skincare products! I also love their line of essential oils in particular because I know they use authentic and pure botanicals that are distilled only from the named plant matter. Sourcing is EVERYTHING when it comes to essential oils to ensure that what you buy actually serves the purpose it is intended for! Living Libations also uses wild-crafted plant matter which is collected from the plants’ natural habitat in lieu of a farm, and they don’t offer any botanicals from rare or threatened species of plants growing in the wild to discourage their disruption or disappearance. I believe that all botanicals and essential oils are definitely NOT created equal, and I wholeheartedly trust the quality & purity of Living Libations essential oils, natural beauty and skincare products! They also put the ingredients list right on the front of their bottles, because they WANT you to read them. I really, really love when companies do this kind of thing! 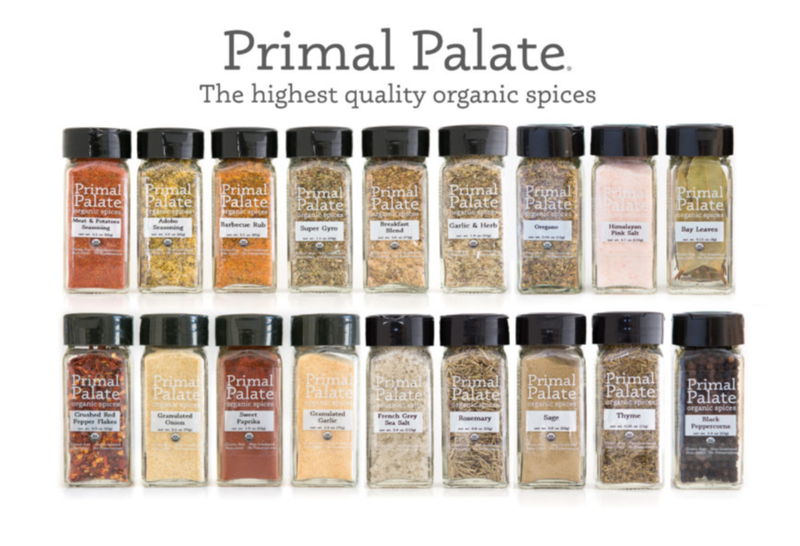 I love the spices and seasonings from Primal Palate because they’re certified organic (meaning they’re GMO-free and no chemicals or pesticides have been sprayed on them), gluten-free, Whole30 approved, and non-irradiated! (did you know that most conventional brands are treated with radiation so you can't tell when they go rancid? Gross!) They also have tons of crazy good recipes over on their blog. Check it out! If I could choose only one splurge for myself when perusing the health food store, I'd have to pick Vital Proteins collagen. It can be beneficial for the skin, the gut, and SO much more, but I personally feel that all collagen is NOT created equal. I've really love Vital Proteins in particular because it's sourced from grass-fed, pasture-raised cows. Not only is their product as minimally processed as possible, it's also dairy-free, gluten-free, Paleo and Whole30 approved. I love the blue tub of Collagen Peptides for adding to smoothies, elixirs, tea and oats, as well as their green tub of grass-fed gelatin, which is great for making homemade gummies! It's also awesome blended into hot drinks as it makes them extra rich and frothy! In the USA, you can find their products directly via their website, but us Canadians are better off ordering through NaturaMarket! When I first began to discover just how toxic my makeup products were, I scoured my local health food store and the web for a cosmetics company that fit my new guidelines. For starters, it couldn't contain any toxic carcinogens, hormone disruptors or anything that could impact my immune system. It had to be affordable, and it had to actually be effective! That's when I discovered Pure Anada - A Canadian company with the most wonderful clean cosmetics at a very reasonable price! You can even look them up on The Think Dirty® app to see just how clean these products are for yourself. Pretty impressive! My personal favourites: Their mascara, blush and eye pencils!